The Transplant Australia Football Club prepare to kick off 2017! Home > News > The Transplant Australia Football Club prepare to kick off 2017! The Transplant Australia Football Club will take to the field for their opening match of 2017 against the Belrose-Terrey Hills Raiders Invitational 11. As part of the Junior Gala Day at Wyatt Oval in Sydney on Saturday, March 18, the teams will be re-contesting the Doujon Zammit Shield, won last year by the Raiders in a close 0-1 result. Doujon Zammit’s family saved multiple lives when they donated his organs after he was killed whilst on holiday in Greece, and each match the Transplant Australia FC play this year will be in Doujon’s honour. Made up entirely of those whose lives have been saved by organ and tissue donation, the inspiring Transplant Australia FC finished 2016 on a high with a draw against NSW Police Public Order and Riot Squad, as part of the Australian Transplant Games in Penrith. It was a stunning comeback by the guys and girls in orange, down three-nil at half-time before putting three goals in the back of the net to even it up. Now, they’re hoping to build on that result with their maiden victory. Club Chairman Matty Hempstalk said that the transplant recipients play to celebrate life, as well as raise awareness of the benefits of transplantation. “The Doujon Zammit Shield is another opportunity to honour the Zammit family and all the other families who said yes to their loved one becoming an organ or tissue donor. 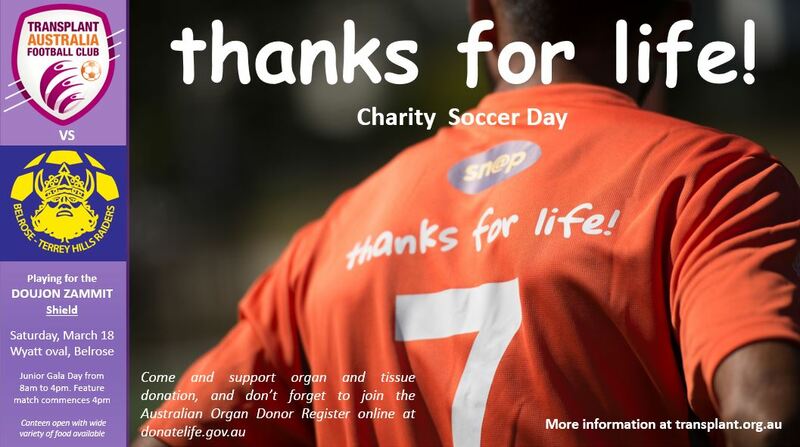 If you’re in the area, Transplant Australia invites you to cheer for the team – we’d love to see you there for a great family day out.